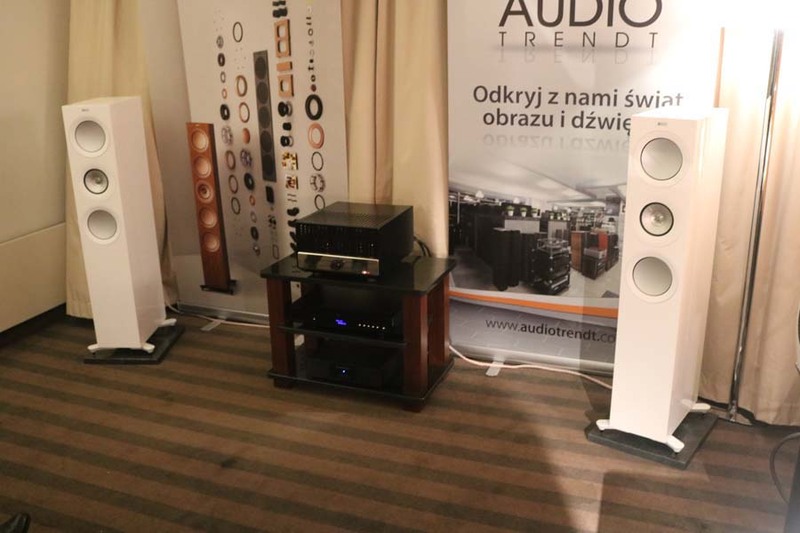 So we’re still on the Radisson Blu Sobieski but we are making our way through the floors and now find ourselves on floor 3 where we pick up the latest from the Audio Video Show Warsaw 2018. 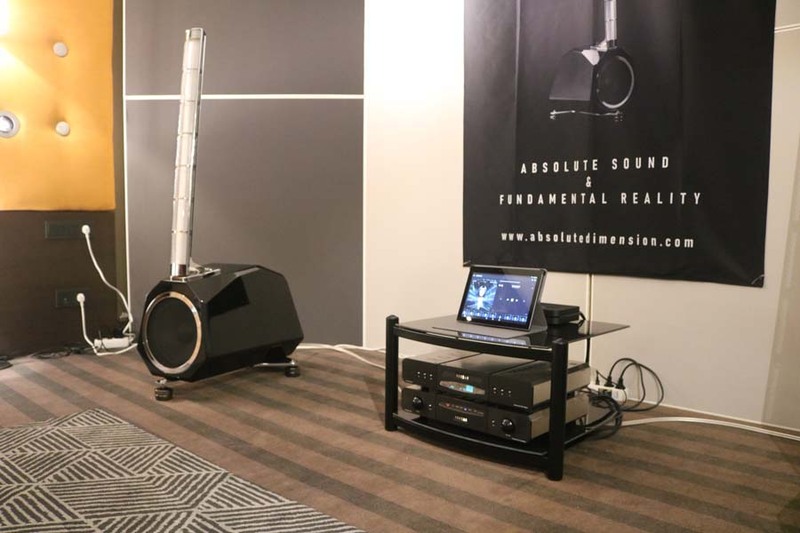 Triple M is an audio shop and distributor in Poland and today they chose to entertain us with a nice sounding and compact system made up of a Mark Levinson 390S CD processor into a pair of active speakers from Avi-d.
Audium are a German loudspeaker manufacturer that make both active, semi-active and passive models of their speakers. 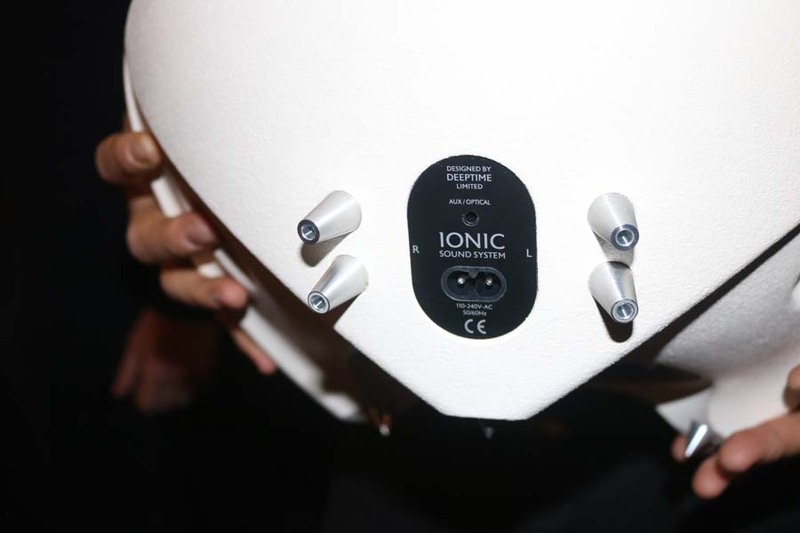 The speakers all feature a full range driver and integrated bass drivers. The speakers being used in this room were the Comp 7 Drive. 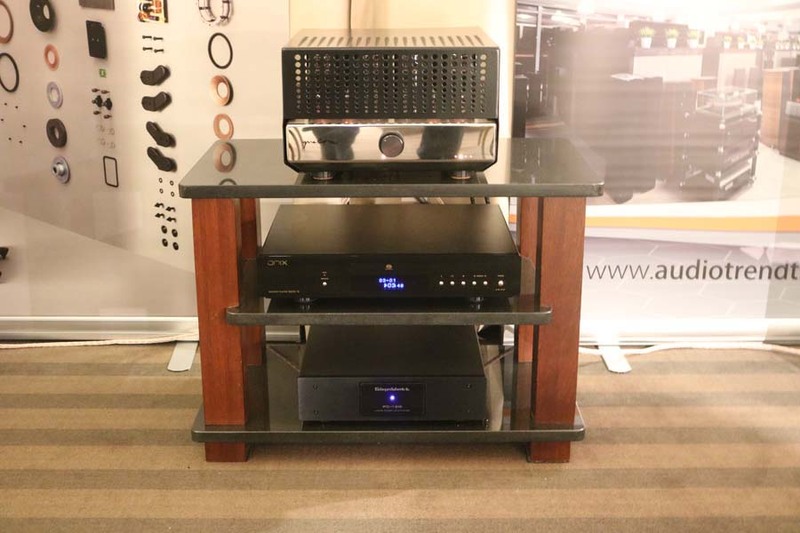 Today thee Audium speakers were being run with an Art G3 CD Player from Audionet…note the amp below is not turned on. 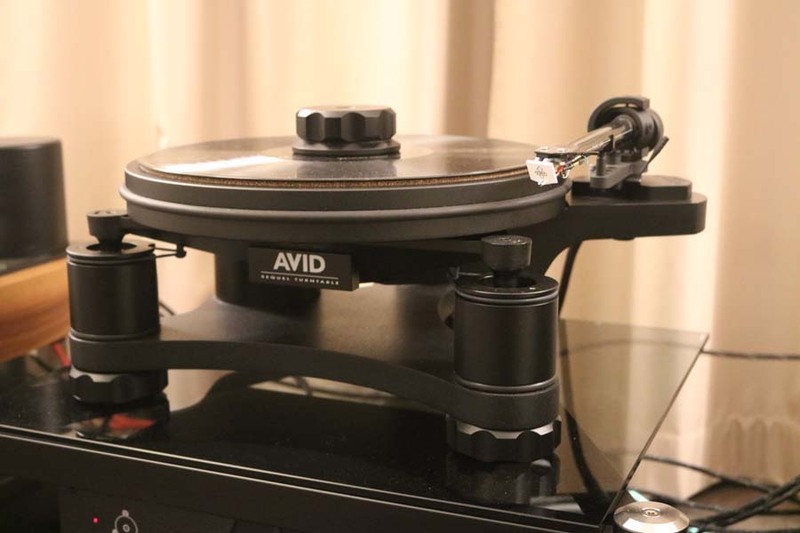 Also in the room was an AVID Hifi Turntable and phonostage with the speakers being placed on Townshend Isolation platforms. This I thought was a good sounding room which went deep but maintained control of the bass. I also enjoyed the imaging from the point source. 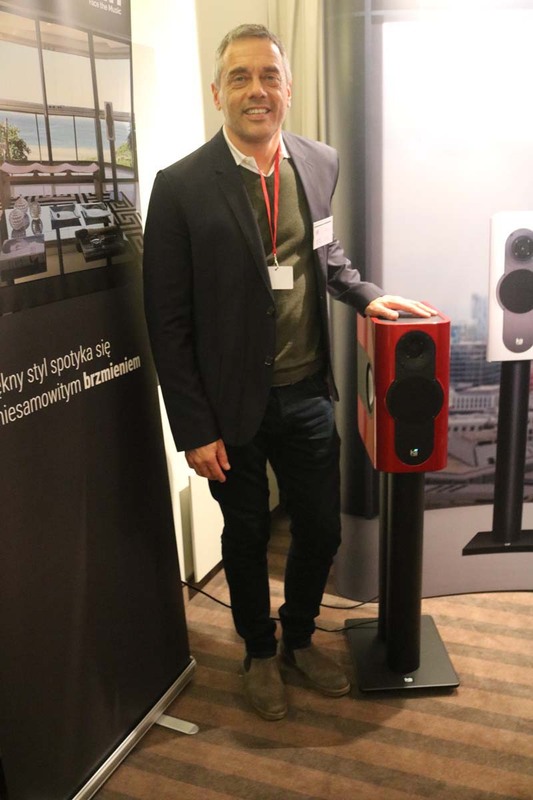 Priced at 27 800€ for a pair Finnish brand Hypostatic’s Indegenum loudspeakers certainly take the prize for being the most unusual loudspeaker so far at Audio Video Show Warsaw. 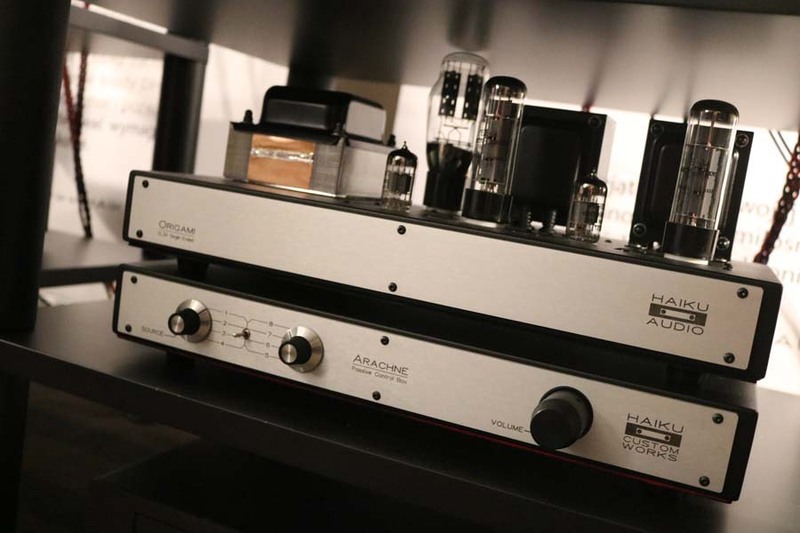 They feature a curved magnetostatic driver for the mid and high frequencies with a horizontal dispersion of 60 degrees and a diaphragm moving mass of just 1.63g. 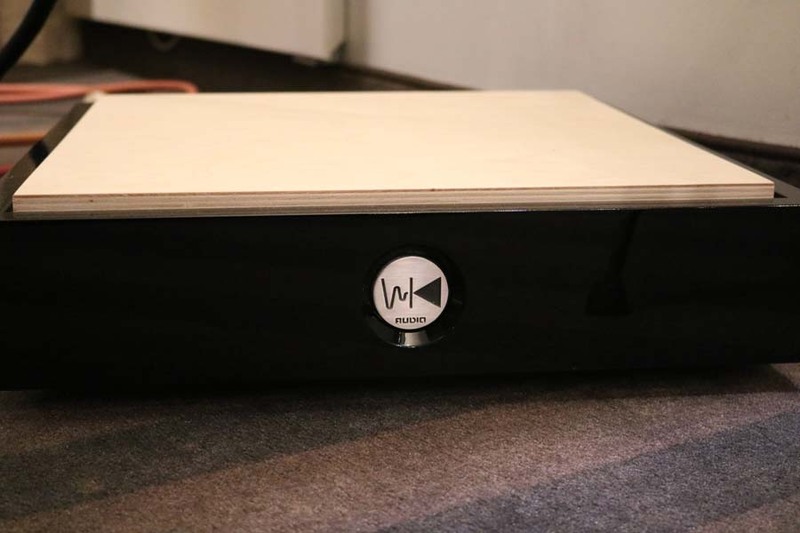 The sub woofer unit is a one piece composit stone unit with any colour you fancy being available. Inside the sub is an 11″ woofer that if further tuned with a passive radiator. 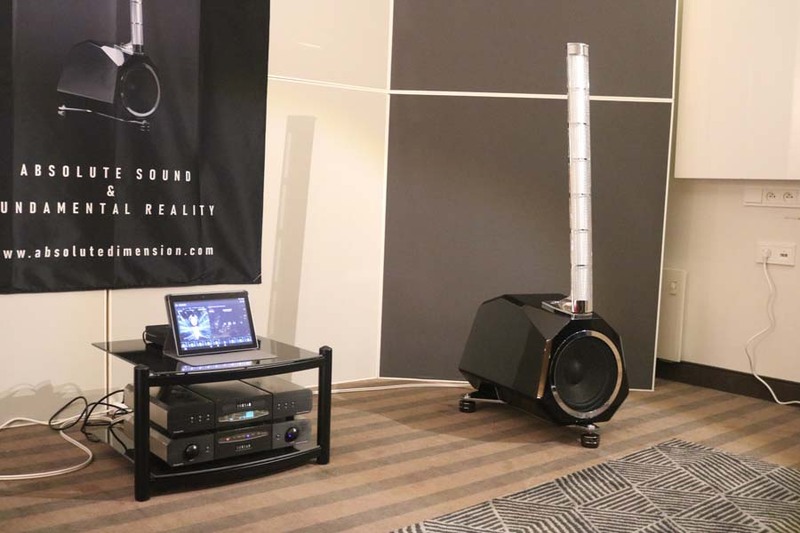 The speakers were playing VERY quietly in the room using Roksan electronics and producing a nice relaxed and unhurried sound. 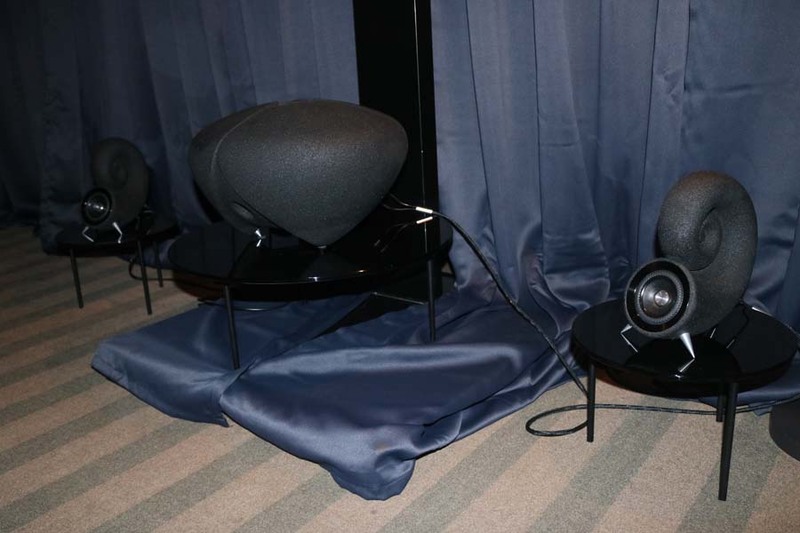 The speakers are designed by Jar Ollenberg and are the company’s first product with a price tag of 27 800€ per pair. This was a lovely cool room that was an oasis after being in some of the hotter rooms. 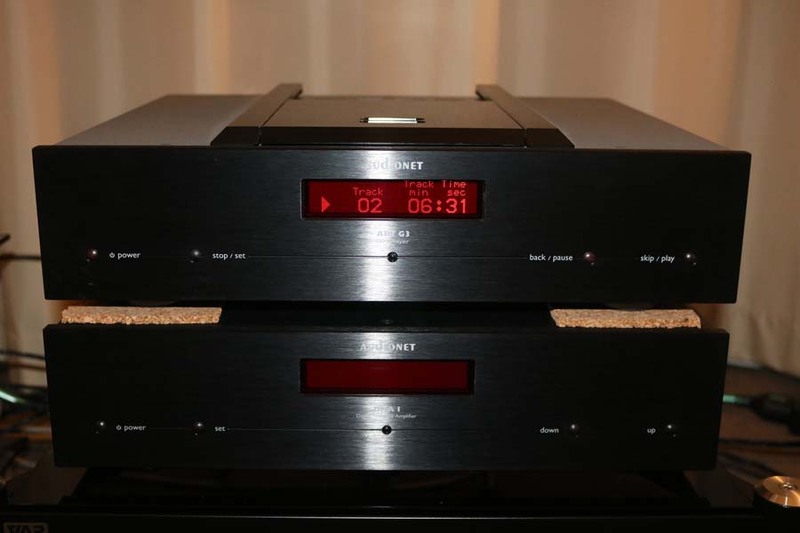 A Qualiton valve amp was driving KEF R Series loudspeakers with an Onix SACD15 CD Player. Power for everything was going though a Giggawatt conditioner. 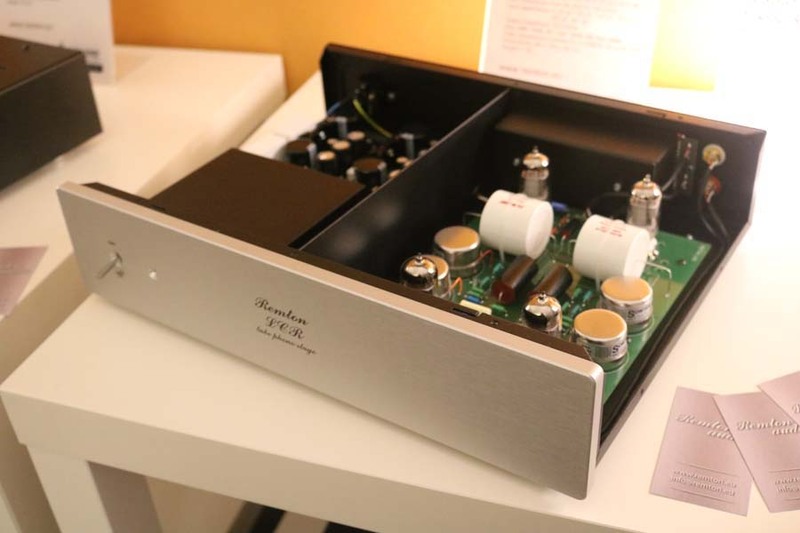 Sparkler Audio are a Japanese brand from Yamanashi. The sound in the room was lovely and I hadn’t seen the prices of their offerings before we got home and was expecting them to be very high given the look and finish on the products. 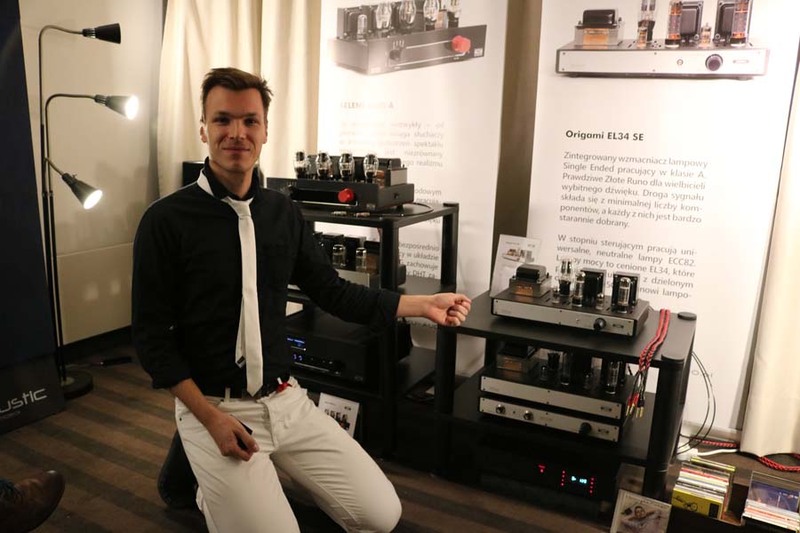 I was completely wrong and they have products starting at less than 700€ (for their Unison DAC). 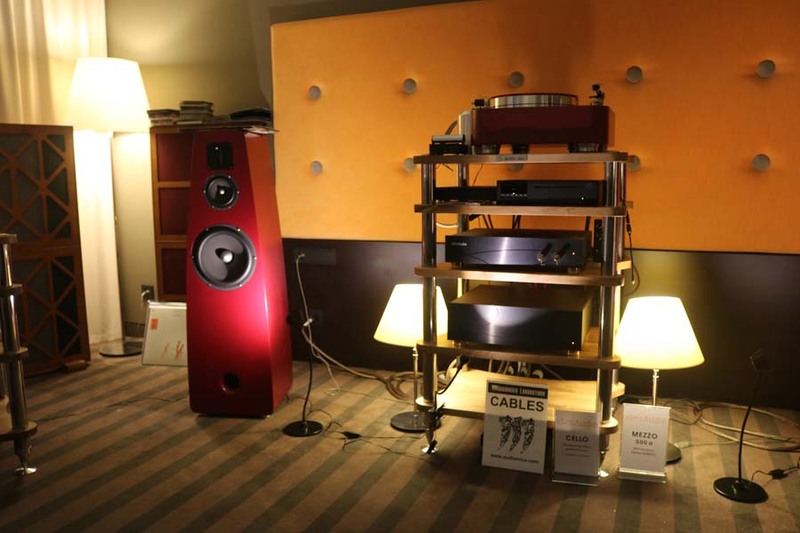 Their Spiral CD player transport is 1600€ and a pair of the single driver loudspeakers will set you back 1600€. They even offer a FM/AM radio in their extensive range of products. Sadly there was no music playing in this room so really can only include pics we took, though we have previously reviewed one of the Remton phonostages which you can read here. 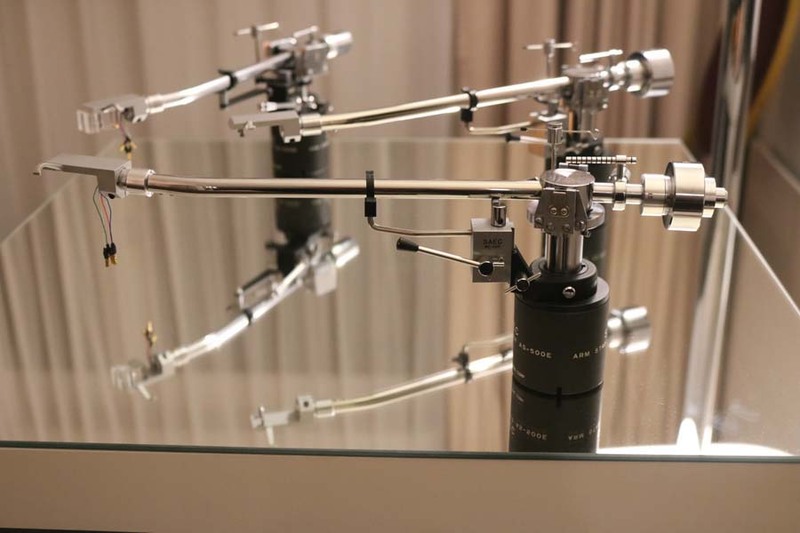 The Fonolab tonearms certainly look the business. 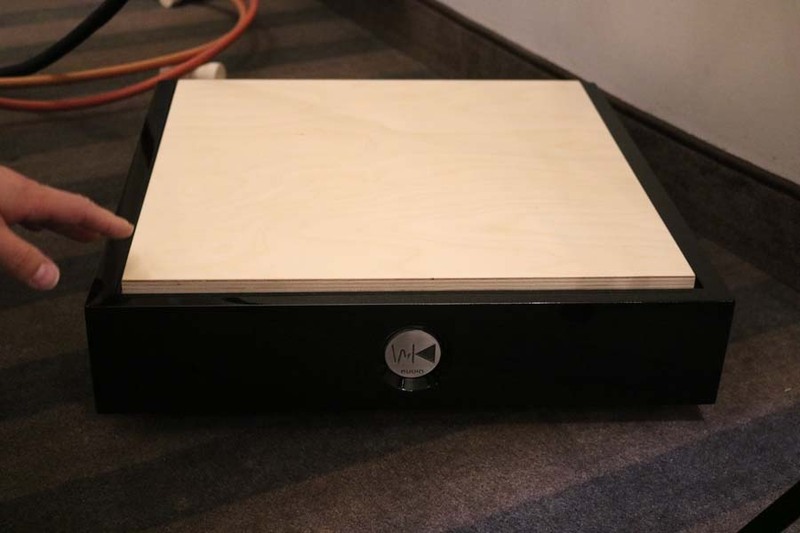 Distributed in the UK by Ultimate Stream the Kii speakers are a bit of a revelation in many ways. 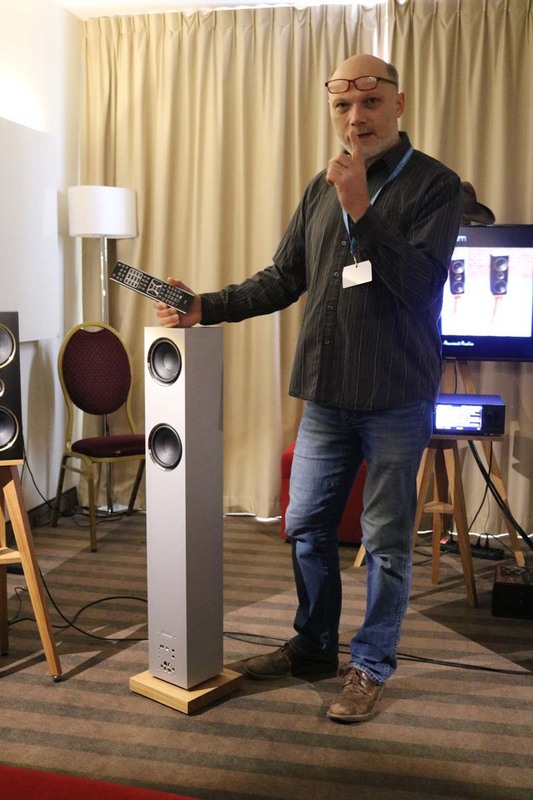 What at first glance looks like an ordinary, run of the mill – if rather dashing – loudspeaker is actually a full integrated system. 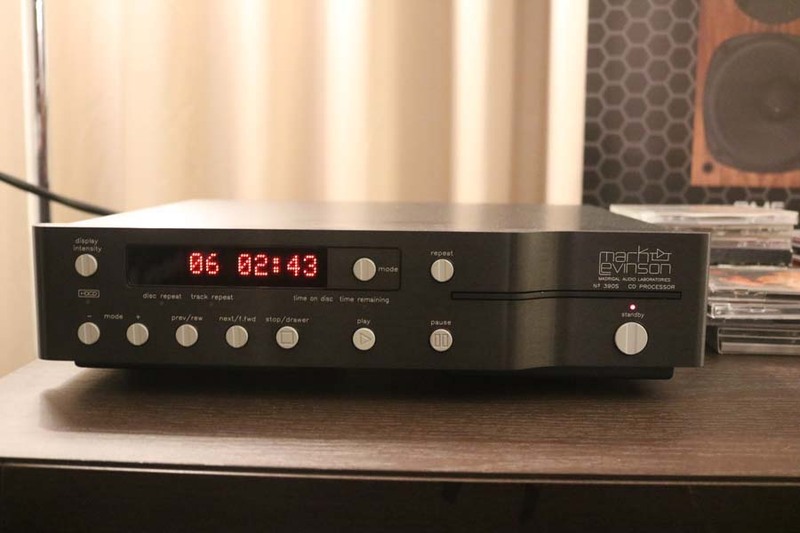 Many see this kind of product as being the future of quality, yet relatively mass market audio…and I agree to a greater extent. Not everyone wants lots of boxes and lots of wires cluttering up their living space and Kii offer a great solution to achieve this. Erykah Badu live was playing when we went into the room and it was a lovely relaxed and unforced presentation. 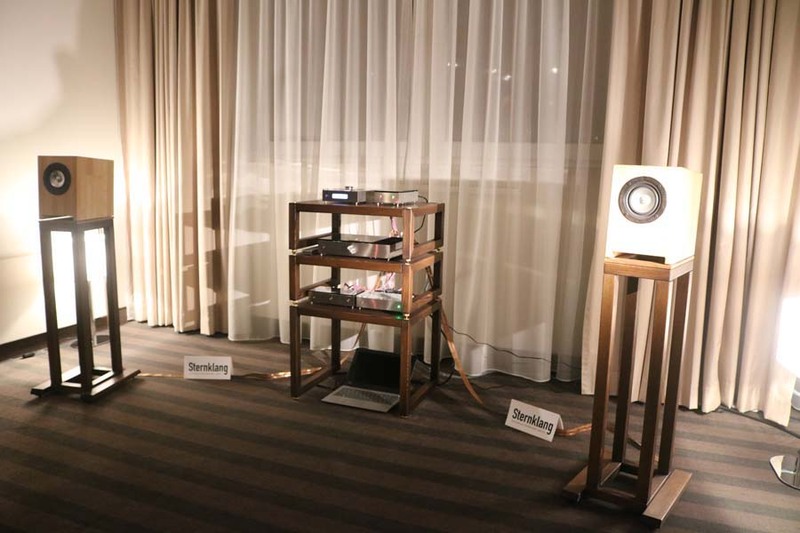 I’ve now heard these speakers a good few times and were it not that I was someone who actually likes lots of boxes and wires, they would be on my shortlist of speakers to get a home demonstration of. 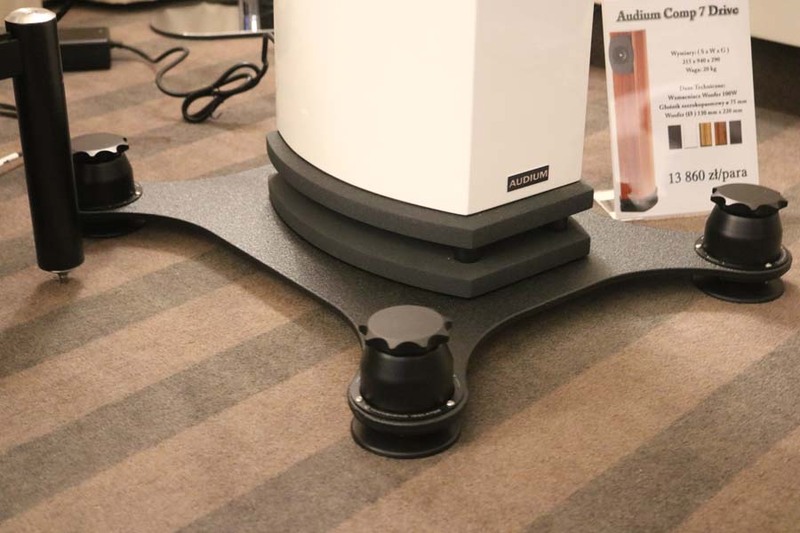 Seriously cool product alert and perhaps THE coolest at the Audio Video Show Warsaw this year. Was it a huge set of horns or a massive valve power amp with a compliment of hundreds of tubes, I hear you as. 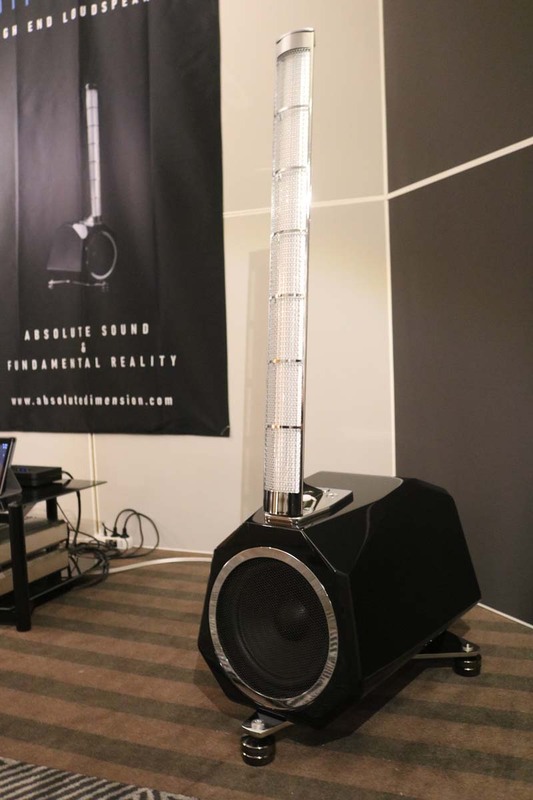 No, it was a relatively tiny set of speakers and subwoofer set up hailing from Prague in the Czech Republic and designed by a trio of guys from the motor industry and this was their World premiere. 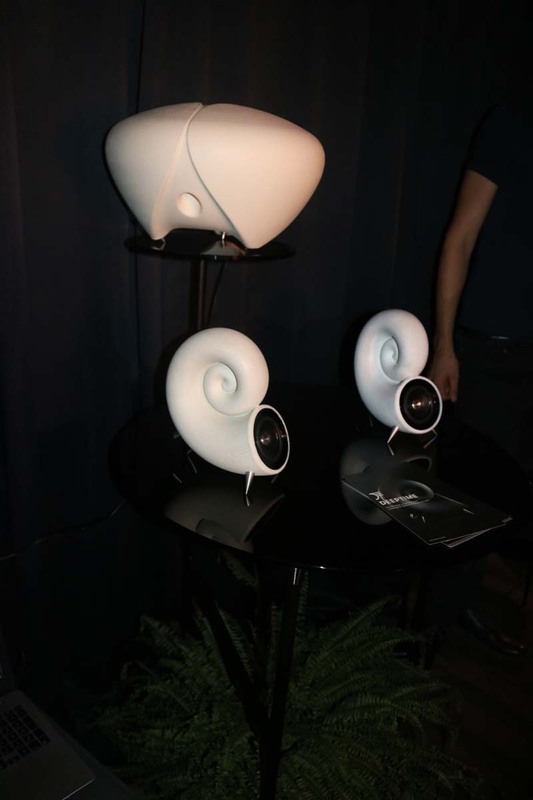 Deeptime presented us the Spirula speakers and Thunderstone bass module and it’s not suprising when you see the pics where their inspiration came from with the speakers being shell-like and the sub looking like one of the sea urchin shells you often find on the beach. 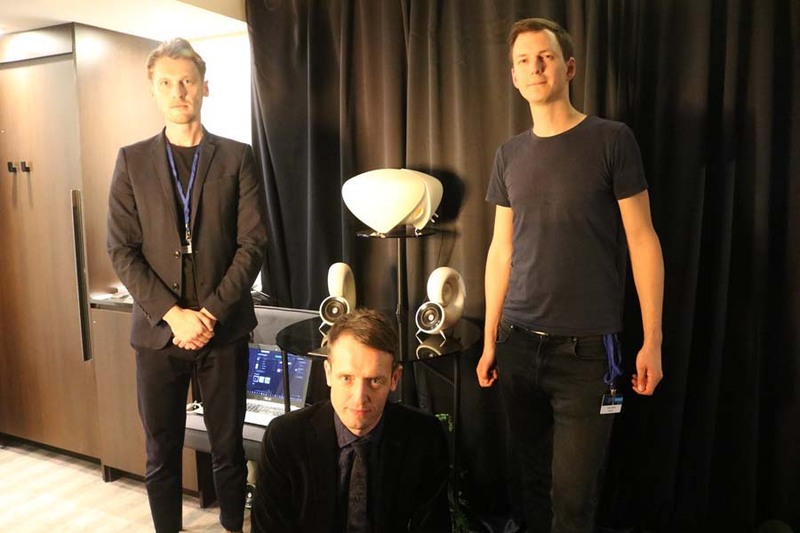 The speakers and sub are indeed 3D printed from SAND – yep, SAND – and have a beautiful textured quality to them – they also weigh a reassuringly hefty weight. . 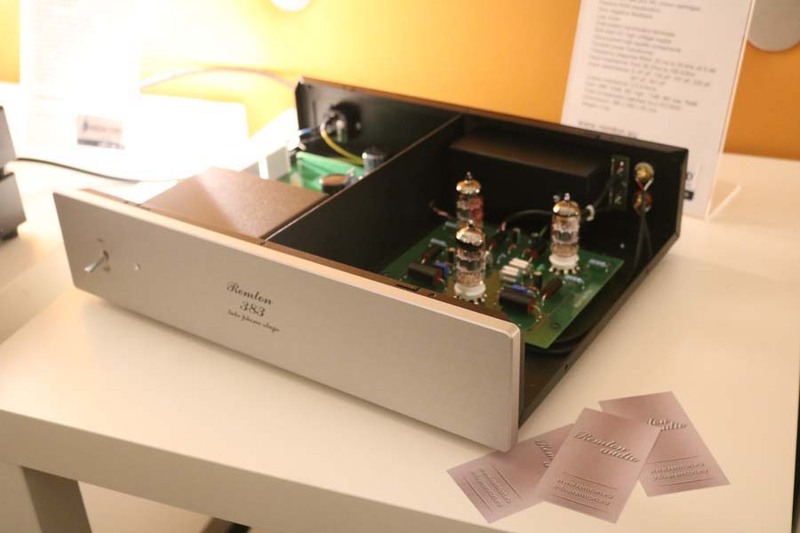 The Thunderstone is not only a sub but has analogue inputs via a 3.5mm jack plus a fibre optic input. It’s a triple ported enclosure unit measuring (LWH) 372 x 372 x 239 mm and will go down to a claimed 40Hz. 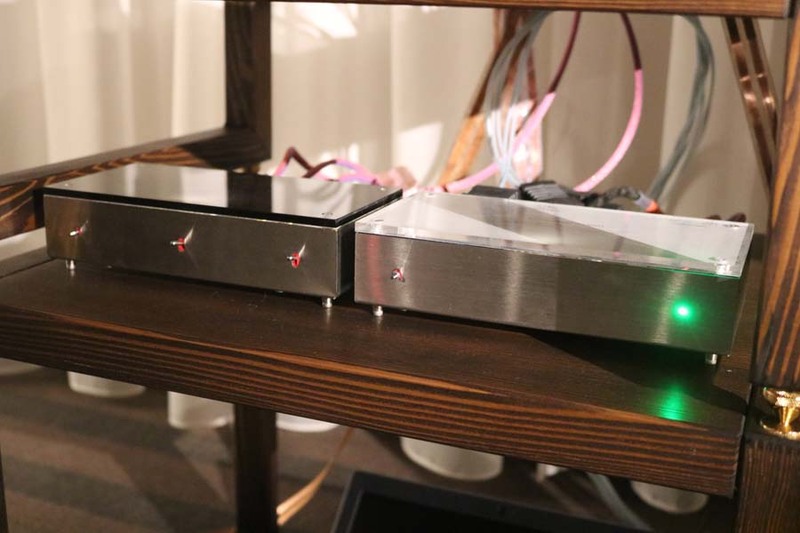 Onboard is a Class D amp putting out 110 W and also powering the satellite speakers with 60 Watts of power each. It’ll also fo Bluetooth aptx and AAC. The two volume control rings on top of the Thunderstone are magnetic Hall Effect sensors which are said to last decades without degradation. They are made of anodized aluminium and act as a passive cooler for the onboard amps. 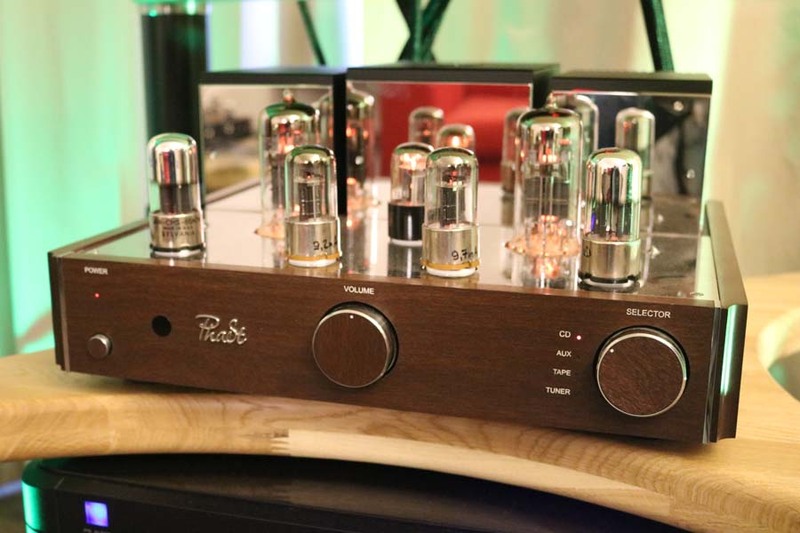 The external ring adjusts the bass whilst the internal ring deals with the volume. The Spirula speakers are also 3D printed from sand and have a three inch full range bamboo fibre paper cone driver. The tapered interior surface has NO flat surfaces. They weigh 2.4Kg each and cover the 75 Hz to 20 KHz part with the sub dealing with everything below that. Easily the coolest product of the show and I can see these adorning the apartments of many folk. All I can add is that I want a full set u … and they cost 3142 Euros. As soon as I walked in this room I remembered it from last year as it had loads of psychedelic paintings on the walls. 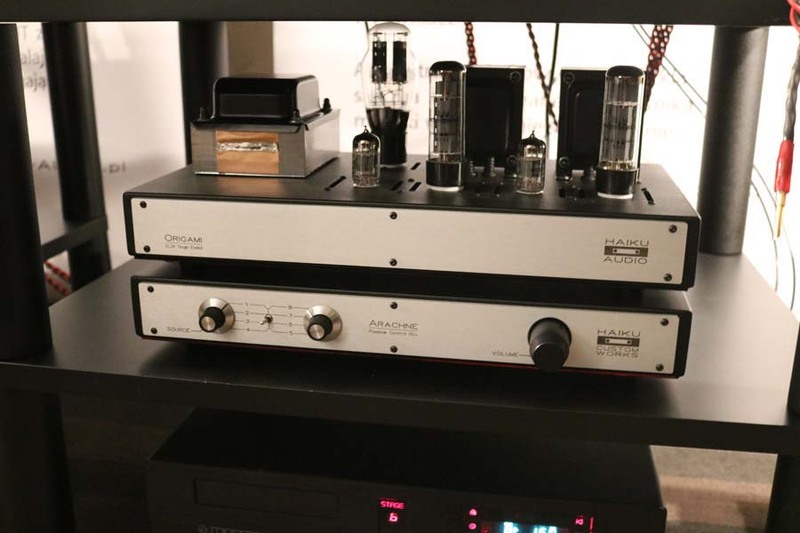 Hifi wise we have a Coincident valve amp, Marantz CD player and Audio Note speakers. 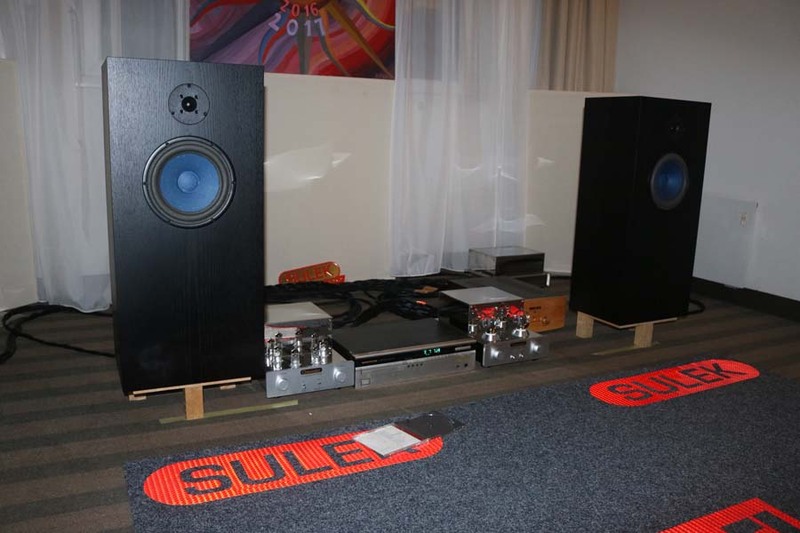 Possibly the nicest I’ve heard Audio Note speakers play and interesting that Sulek chose to have the speakers out in the room with no toe-in rather than the normal (for Audio Note) in the corners with massive amounts of toe-in. 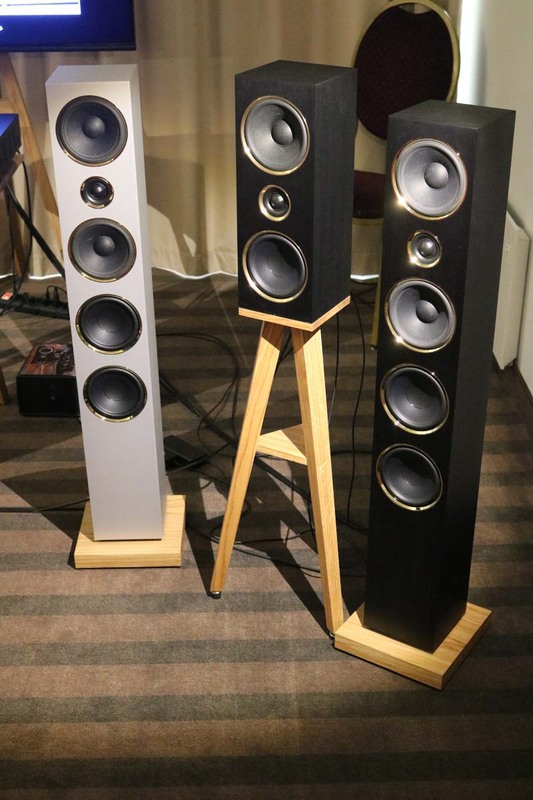 I have a bit of a soft spot for Triangle speakers and really enjoy all their offerings from the cheaper end right up to the Magellans. 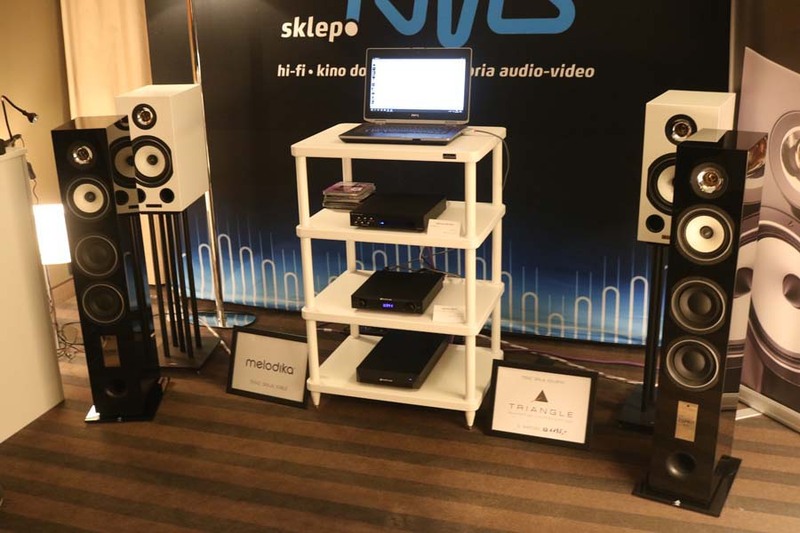 Here they are partnered with CDT-8 CD transport and DAC-9 DAC and pre from Nu Prime to make a very nice sound indeed…and for not a lot of money. 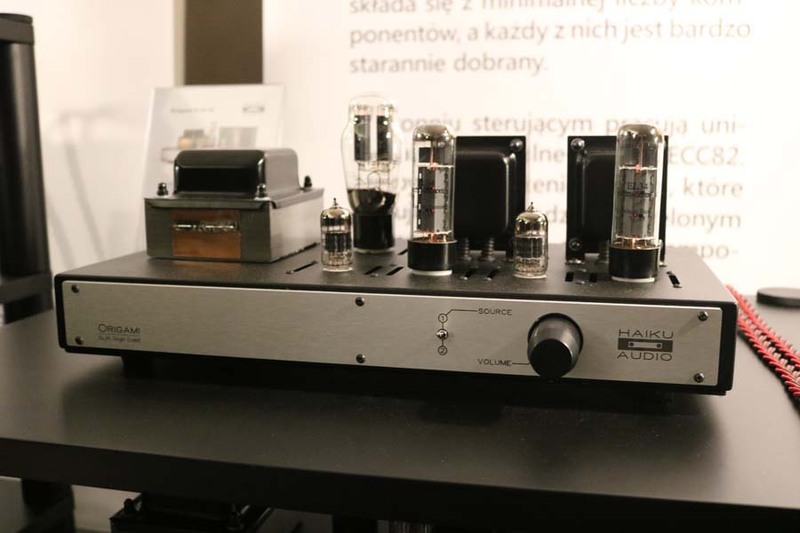 Here we have another Polish brand Elins who supply the pre and power amplifiers. 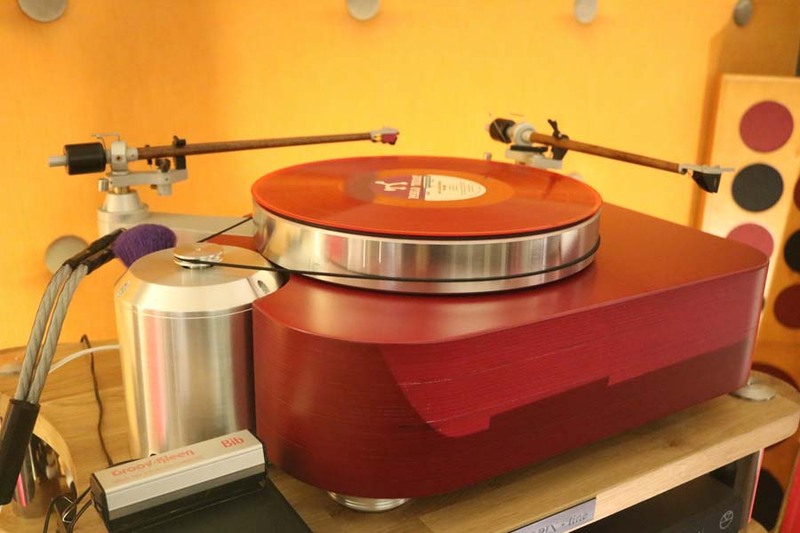 sadly we were unable to get information about the turntable and speakers but both looked very interesting, particularly the turntable. 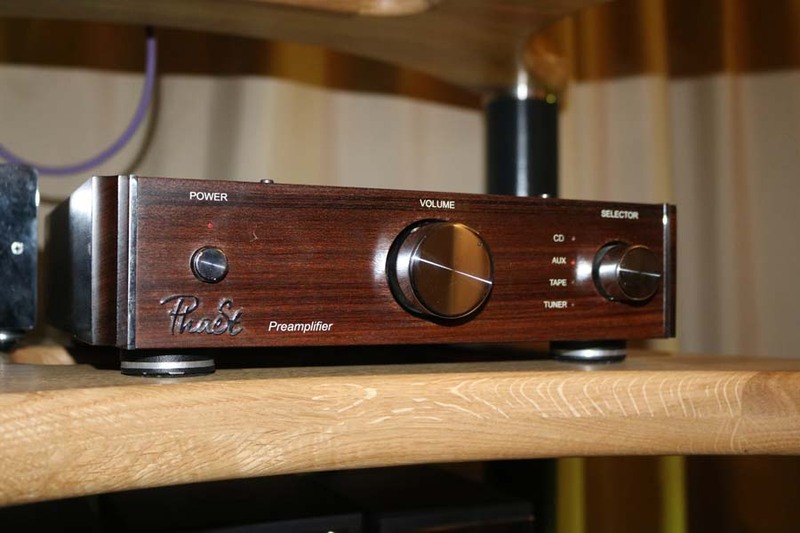 PhaSt are from Ukraine and make just valve amps and pres. 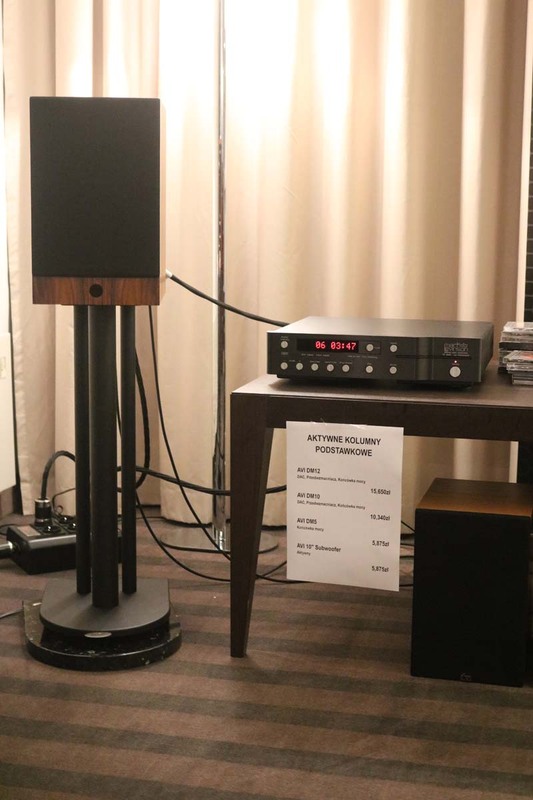 When we walked into their room we were pleased to be greeted with a nice sounding room playing some good music through a pair of unknown horn loudspeakers with a 15″ driver. Halfway through the tune that we were really enjoying they flipped the switch and put on some plinky-plonky jazz and so we left. This is a major gripe of mine at shows – the exhibitor has a captive audience who are clearly appreciating what is playing and then abruptly changes the music to something completely different before said track has finished. 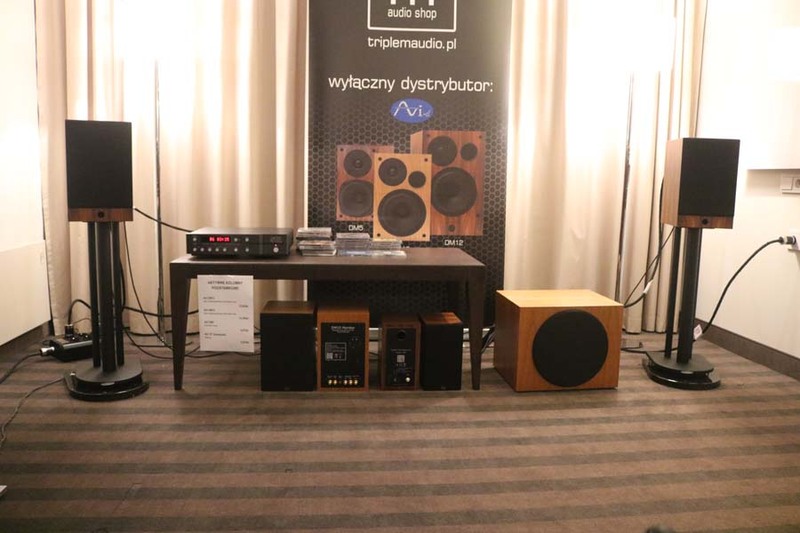 Now these speakers are interesting and we covered them in some detail in our coverage of last year’s Audio Video Show Warsaw. 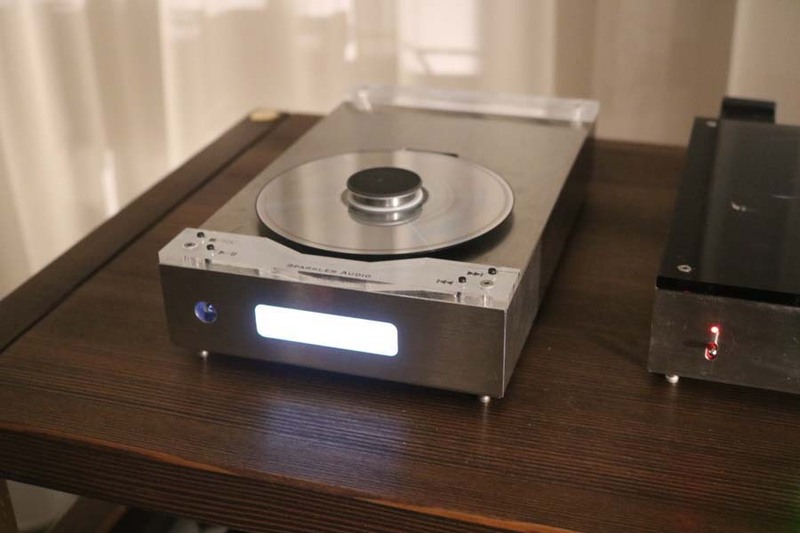 They are made of Aluminium, are active and have digital inputs so all you need do is add a source, in this case a Cocktail Audio player. 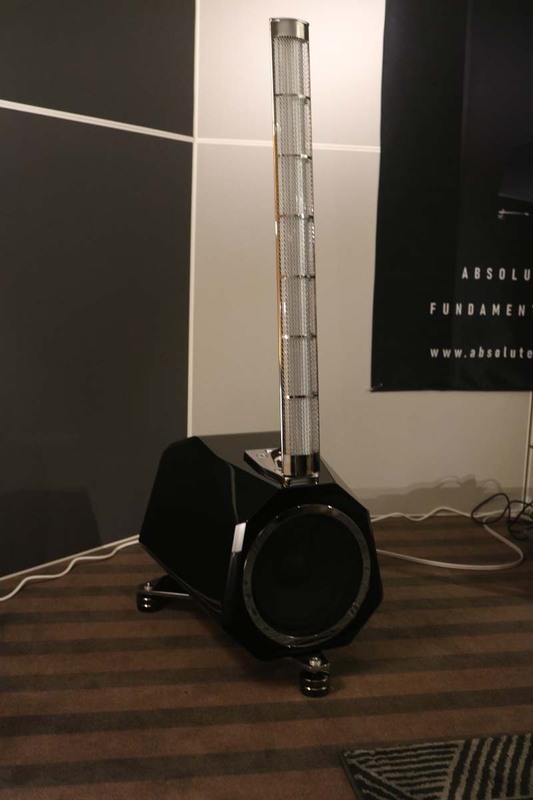 The Mini speaker is 4000€ and has all the electronics in just one speaker whereas the Maxi costs £6000 and has an amp in each of the speakers. The new series of speakers now have a passive bass radiator (these really are coming back into fashion in a big way) round the back and have a built in DAC so that they really are plug and go. 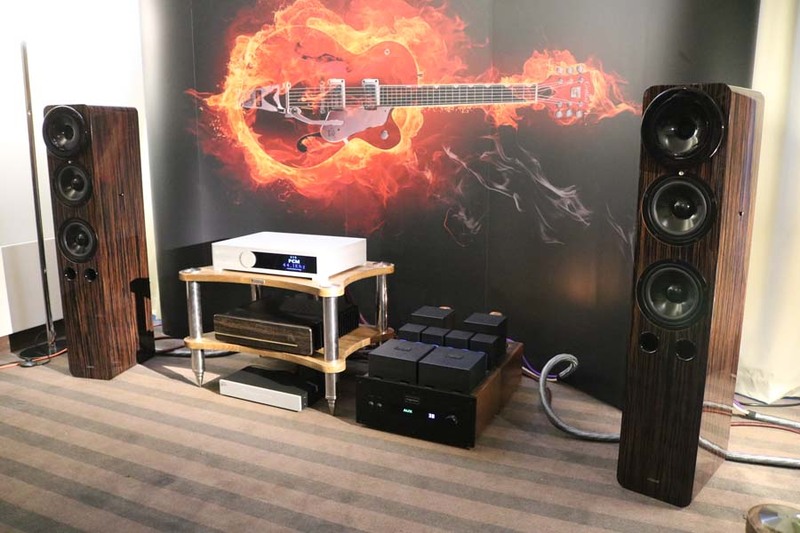 Now this was a lovely sounding room and the new Origami EL34 SE amp goes to prove that you don’t need to spend a fortune to get great sound – it is around 1000€. 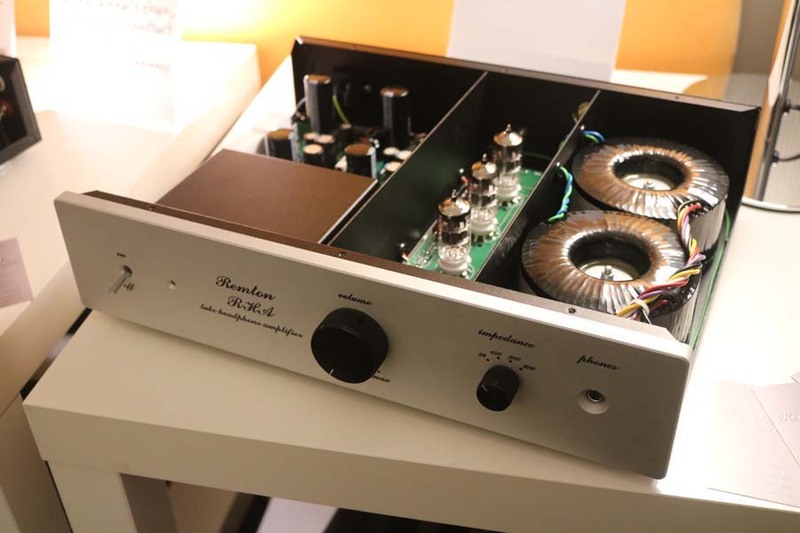 The amp will deliver 10 Watts per channel and uses a tube regulated power supply. 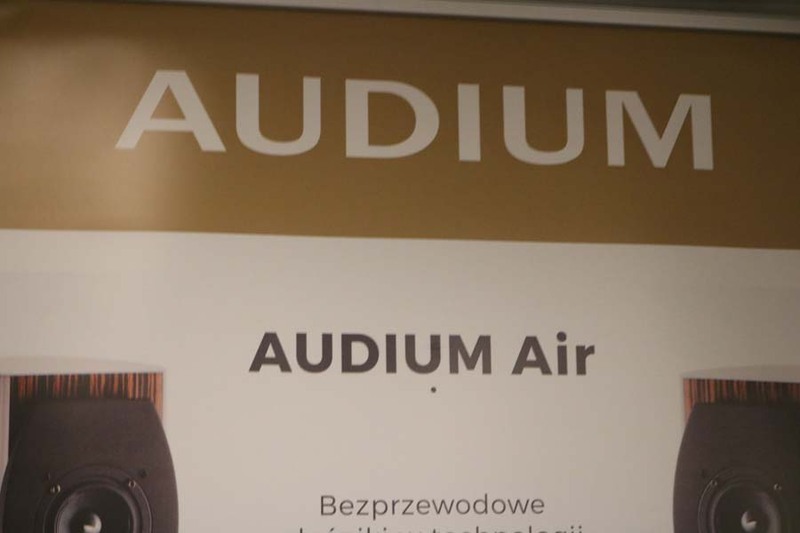 The company try to source as many parts as possible in Poland and a pre/power version of the amp is also available. Not pictured is a pair of prototype loudspeakers that use a 20cm bass driver and a dome tweeter. They have a “flow port” so that they can be used in the corner of rooms. I’ll not name them but the next room we went in was impossible to cover as the people running the room we talking loudly throughout the time we were in there. OK, I confess to not having the slightest clue what all the techy stuff that goes on inside these boxes is all about, and I really don’t want to know, but by crikey whatever they do they do something very right. The guys in the room played Contact by Daft Punk for us and the track just opened up with so much more space around the music. 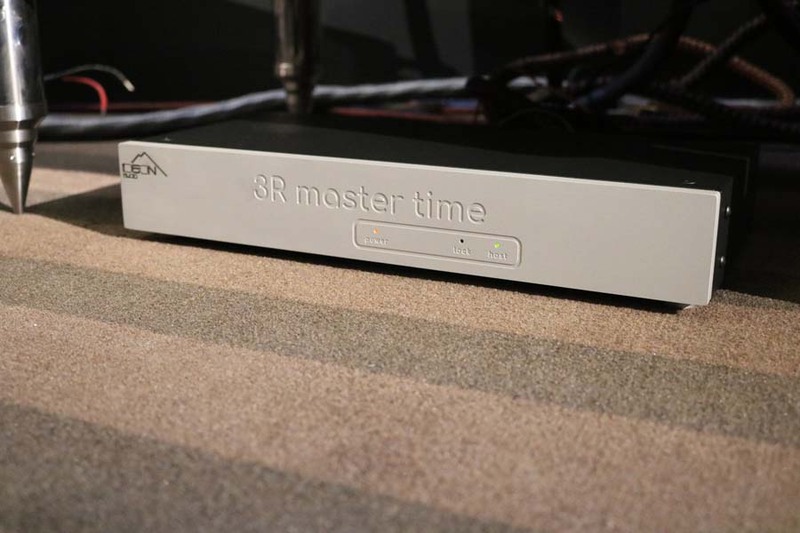 Here we have the Ideon Audio 3R Master Time USB re-clocking platform and the final edition of their Absolute DAC, a design based on the hi-resolution, “hyperstream”, 32 bit, 8 channel ES9038PRO SABRE DAC chip from ESS. 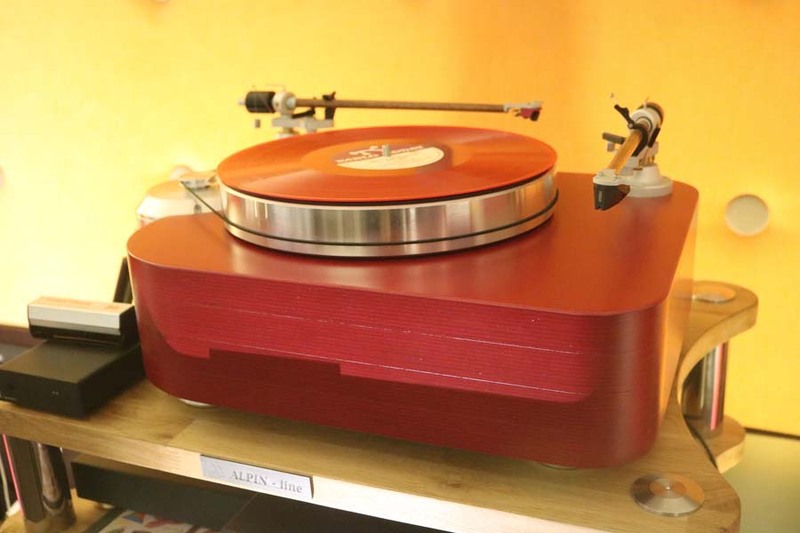 Both devices, like all Ideon Audio products are results of in-house proprietary designs. 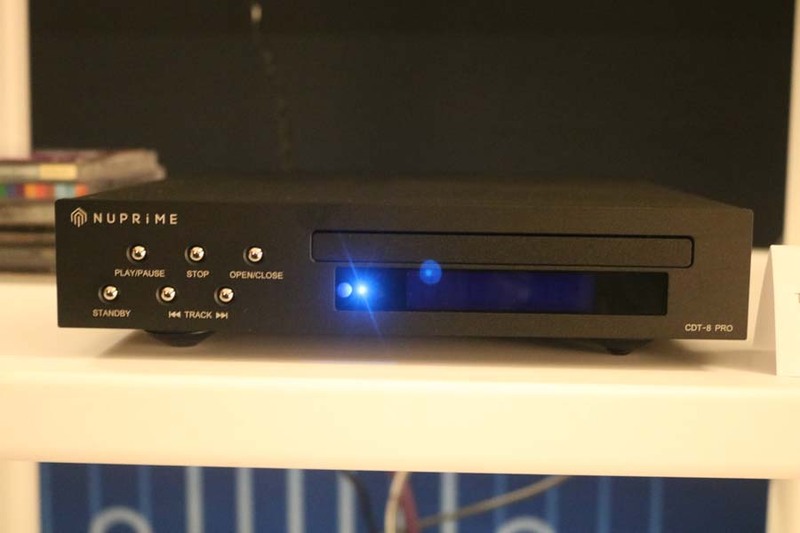 The LDMS (Lucas Domansky Music Server) completes the computer audio solution presented and acts as the system’s digital source. 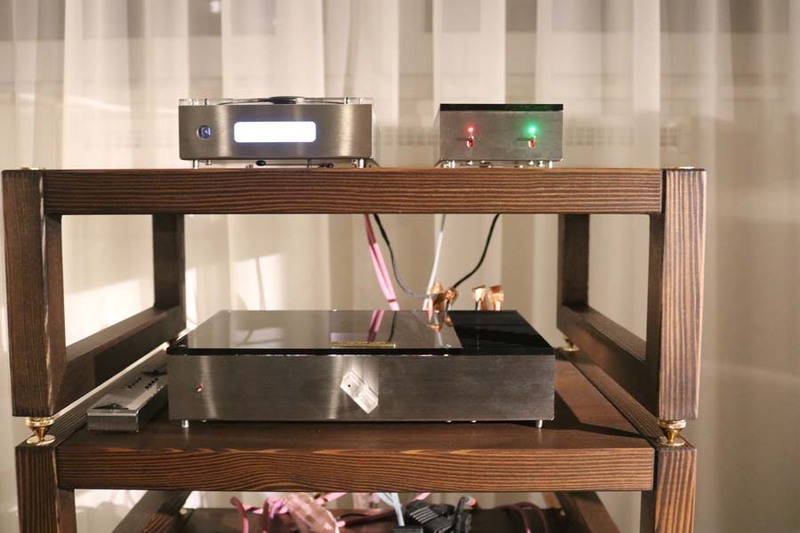 This music server is the result of four years of research and development.The Ideon Audio 3R Master Time then “Re Drive – Re Clock – Re Generate the USB signal” and uses triple ultra-low noise linear power supplies, Femto, ultra-low noise phase clock and dual re-drive signal conditioning chip which the company says turns any PC/Laptop into a “truly high-end source”. 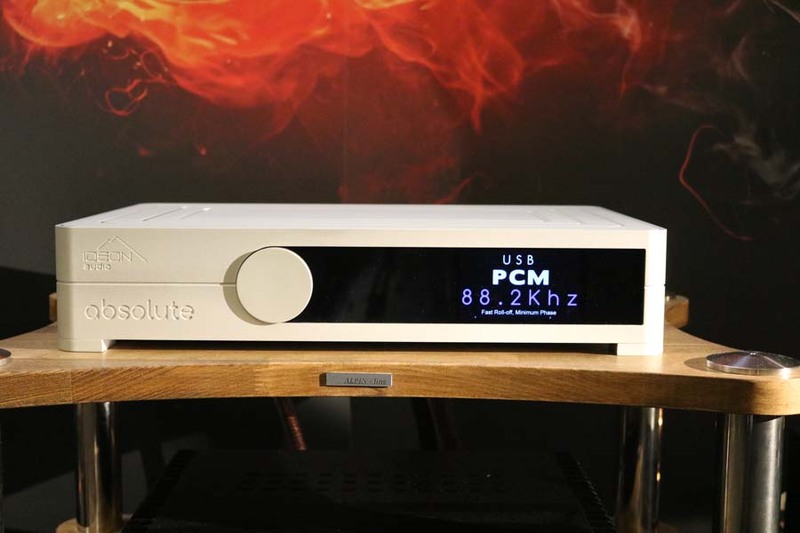 The absolute DAC comprises “end-to-end proprietary circuit design, ingenious combination of the best selected electronic and mechanical components, and no financial compromise at any stage of its R&D and construction” say the company. 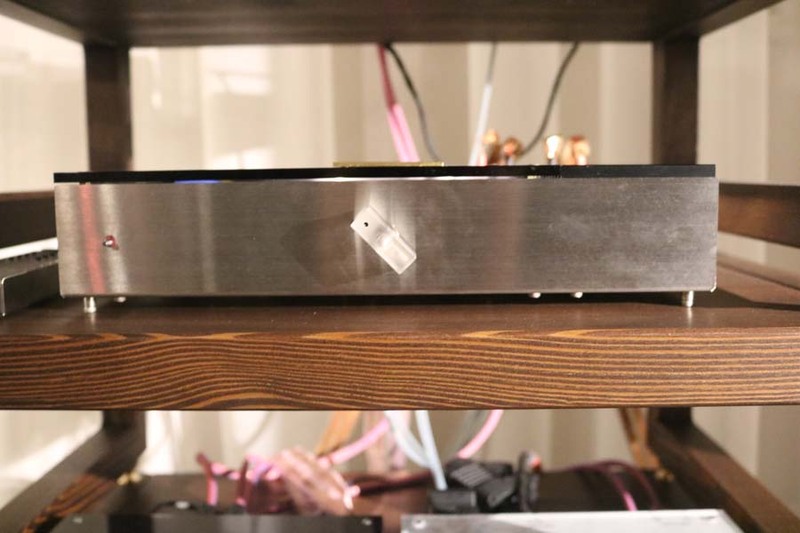 It is fully balanced throughout, has Ideon Audio USB and S/PDIF inputs, uses Ideon Audio’s modular, quad channel (balanced) analogue output stage, plus an “Extreme Ideon Audio” linear power supply configuration boasting seven local power supplies and dual and “exceptionally large” main power supplies. 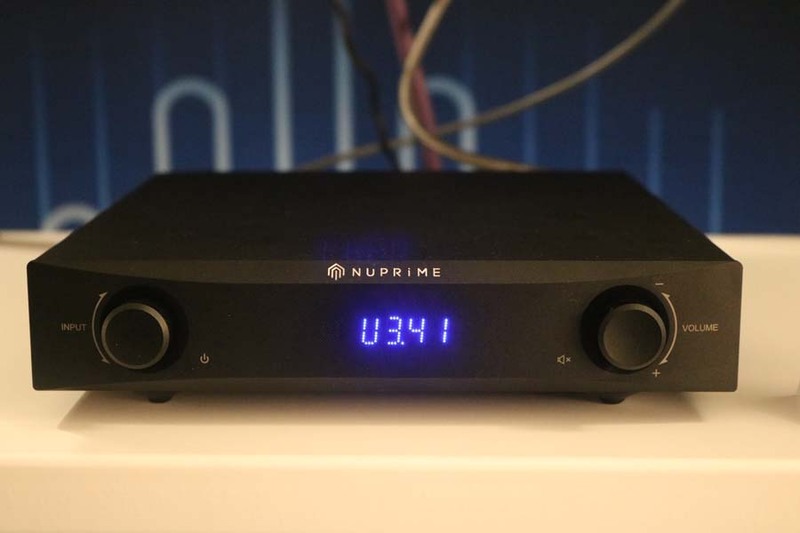 In addition it uses three ultra-low jitter clocks and the ESS ES9038PRO 32-bit 8 channel, Hyperstream DAC to give 140dB (max) dynamic range (DNR) which the company says is the industry’s highest! 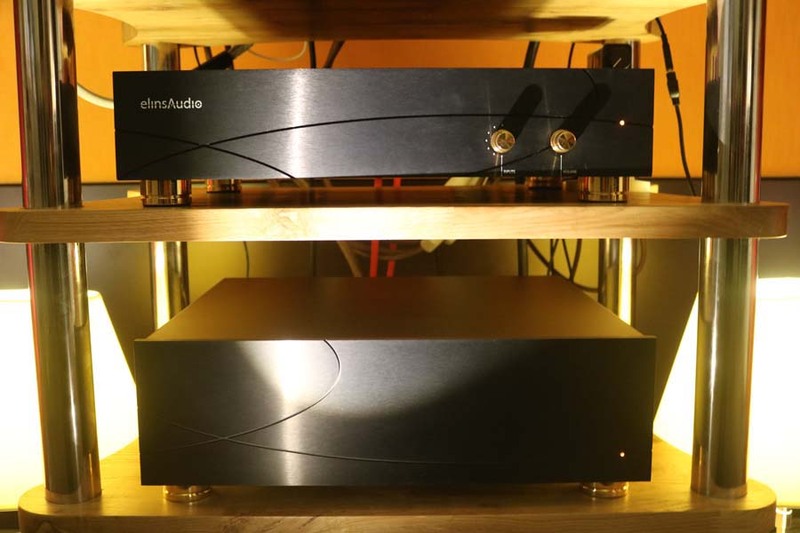 The LDMS is a “state-of-the-art unit”, featuring “numerous unique optimisation techniques in the system architecture and software & a bespoke hardware implementation for virtually jitterfree playback, providing extreme levels of EMI/RF shielding, vibration control, chassis dampening and true galvanic isolation, coupled with premium-quality, ultra-clean linear power supply and solid-state storage for minimum data retrieval latency & minimal electrical noise”. 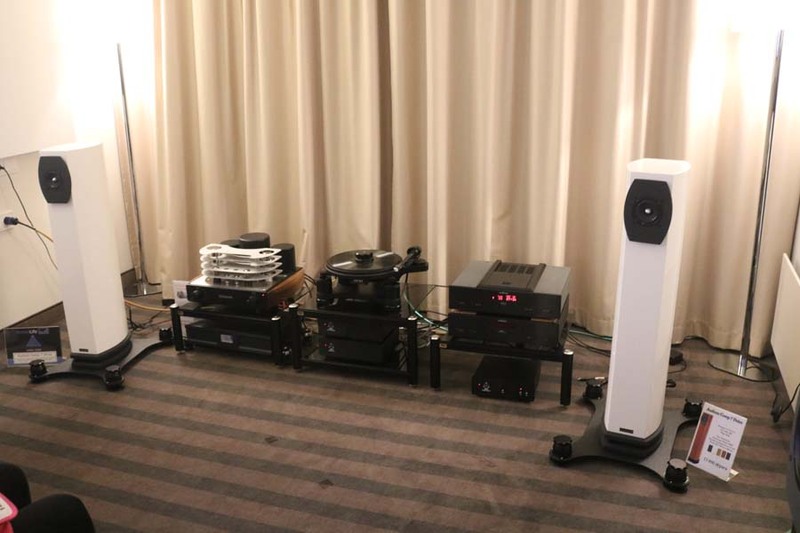 The speakers in the room were relatively inexpensive models from hORNS and my notes about this system simply say “Superb. 5 Stars. Fu&*ing brilliant”. I can seriously see some kit being sold from the reference system to make way for this line up – yep it was that good! 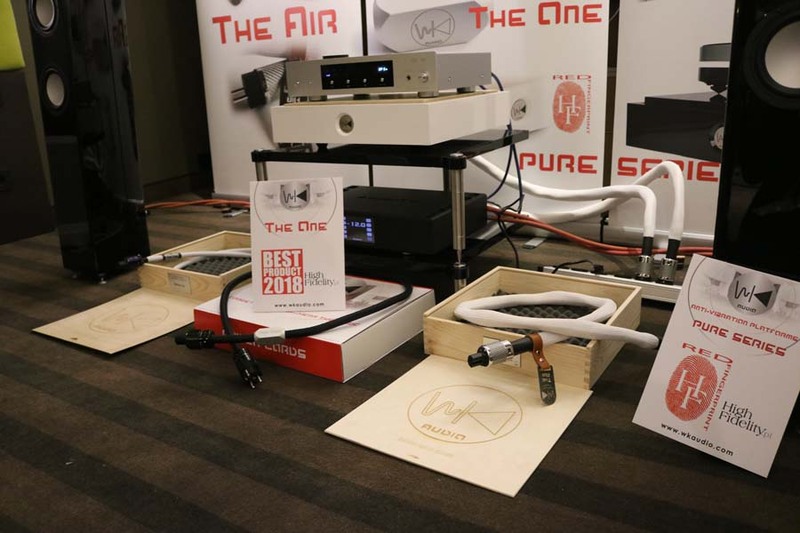 WK Audio make power cables and an isolation platform and it was the latter that really caught my attention. The chap that makes these isolation platforms is actually an architect by trade and he has applied architectural principles to the platform with it being made up of different materials with different weights and structures so that it reduces different frequencies – it also moves in 3 dimensions. It weighs 25 Kg and costs 650€ plus taxes. Speaking to the designer, Walter Kaminsig, about his thoughts on cables he is of the opinion that power cable in particular are more about the mechanical structure than the electrical structure.